This is the type of entertainment you want to have in your man-cave or living room to fit the type of lifestyle your looking for. 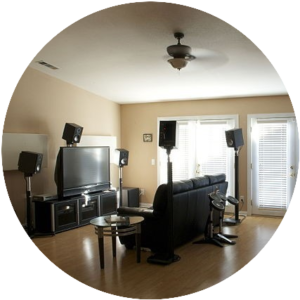 If your looking for ideas for a super bowl party or maybe you want to impress your girlfriend or boyfriend on a Saturday night with the power of sound dynamic Bass to shake the room. This is the type of article you want to read on about. What is considered the best rated sound bar system? I love the wireless and Bluetooth features this system has. Also, a one-year warranty? I know this is starting to sound too good to be true, but wait until you see the price. I believe your getting the best for your buck when it comes to this type of technology, compared to other brands, I think you have the better buy with a LG sound system. Don’t worry we will cover the comparisons of the best sound bar systems to give you good choice to make. I just have to show you specifics to this Lg sound bar just to make sure all of your bases is covered. The sub-woofer and surround sound speakers can connect to WIFI to these devices but the output this thing projects is truly amazing. If the sleek black slim design doesn’t impress you, listening to it in full performance will shock you due to the size and the level of sound the system delivers. The LG have a way of getting the best out of its products, I noticed later models with same similarities but has same different features as well. I would recommend buying the LG SJ8 sound bar. The love I have for wireless features and great sounds from a thin 1.5″ inch sound bar that could power up the house with entertainment, you got to check it out. The Sony Z9F sound bar has the tools to do damage when it comes to performance. When was the last time you gave it the eyeall test give it the eyeball test, nothing really stands out just on looks, But in terms of features, and quality, and style its up to you as the one to make the right choice for yourself. My mission is to make sure your choices is good ones and I always try to impress because we want what we paid for right? so here is the SonyZ9F’s list of specifics. Sony has this new feature called the 5 sound modes for movies, music, video games, sports and news. When was the last time you gave it the eyeall test switch to any of these modes your right into the action a push of a button. Sony Z9F also has 7.1.2channel speaker system so speaker placement is much easier. No matter where your at in the room, the sound bar system bring you into surround sound without the extra surround sound speakers. Adding in same extra speakers could hurt all besides, this is what using a sound bar is for. Sony(Z9F) has 4K HDR capabilities, LG(SJ8) has high resolution audio but Sony has Dolby Atmos sound and I think when it comes to less space, fast and easy hook-ups, best features, Its Sony for me. But I believe both are still win-win brands with high quality features and top of the line design to make your living room come alive with entertainment. These models I picked to be my three top brands due to the level of demand and has the most to offer on price. VIZIO Sound bar has the same killers sound technology. The sound bar kicks out about 70 Hz of Bass with 95 decibels firing out, you will experience the movie instead of just watching it. Advanced in sound to the point every silent whisper to every explosion you will experience this game changing sound bar. Did I mention it has the sub-woofer build-in? SONY Not only does this bad boy have a sub-woofer, but this also has the S-Force technology capable of surround sound built in displaying throughout the room with crystal clarity sound best thing about this sound is its wireless connectivity, it wonderful and gifted to make your room look an a lot sexier. KLIPSCH Sleek 3D surround sound mode which is a good thing the fact that most sound bars are only designed for the movie-like experience. The Klipsch sound bar has the power to really bring the action into living room. I’m going to clear to you this subject because I believe in the hard-working person that wants to enjoy your own lifestyle. If you wish to invest in a rather pricey sound bar system cool, but make sure this is something you have saved for and not sacrifice. The new world of technology beckons to our wonder, to open up a whole new way of living together enjoying home entertainment on a budget. The detail quality of sound and the way it ignites your living room with action and clear home theater surround sound is truly amazing and well worth a deserving investment. What would be your Ideal speaker System? What’s your style? does the Sony sleek and powerful system interest you? Maybe you demand more bass power for music songs, or you would like the works with a little more to it. These are the things I’m looking to uncover for you to se the difference in price, quality and performance. But I still in intrigued to know more from you about your ideal sound bar sound system?